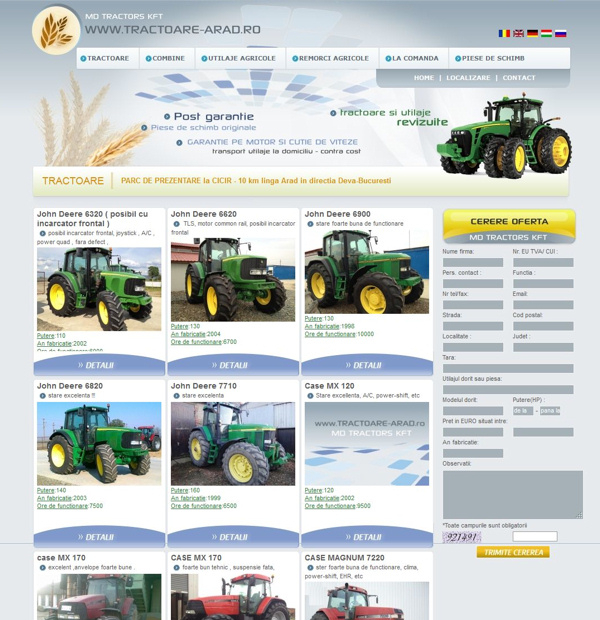 Md Tractors in Hungary opened an agricultural park in Arad appealing to our company to develop a corporate identity and an online products catalogue.Thus we developed tractors onlineshop design and agricultural machinery and trailes onlinestore development. Working with Md Tractors lasts for about 4 years and began by making the first presentation site. In 2011 the company decided to present agricultural machinery online so it turned back to our company for rebranding and developing an online store. Online catalog features a complex application form, dynamic location map and contact form. Royalty currently performs custom graphic design for business cards, flyers and advertising banners for newspapers and magazines.